Becoming a construction and building inspector can be an outstanding job for people who enjoy engineering, architecture, and doing a job that matters. Many people can work in this field, though specific education and training are necessary first. In most situations, this type of job is critically important to the well being of a city or area because it ensures that every structure people are in is as safe as possible. 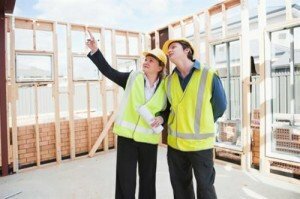 To become a building inspector or a construction inspector, consider the following steps. The Oregon Construction Contractors Board, a state agency overseeing inspectors and their qualifications, states that a home inspector is an individual who provides a thorough inspection and written report on the physical condition of a structure. Many work with homes, but commercial buildings, roadways, and government offices all need the same type of inspection. These individuals will inspect the exterior, roofing, electrical systems, heating systems, insulation, ventilation, air conditioning, and the structural components of the interior of the structure to determine if they are sound. Additionally, many inspect built-in appliances and specialized features, such as elevators. Some individuals work as code compliance inspectors. In this instance, they work with building departments to ensure that changes made to the structures in the city are safe and within the requirements of the city’s code. The building code is meant to ensure safety and to meet the city’s overall goals structurally. Most states require that anyone providing a written report on the condition of a building and/or guaranteeing the accuracy of such a report needs to have a state-issued license to do so. In short, a home inspector must obtain necessary education and then sit for a state mandated and provided test. This ensures the individual’s working knowledge is effective enough to spot potential problems and to provide an accurate report. People who wish to become a building inspector will need some type of education. Most people will earn their high school diploma or an equivalent. Then, the individual will likely enter into an apprenticeship program with an inspection company. This type of apprenticeship program can last for several years or less depending on the program and the state’s requirements. Individuals also will obtain most of their education and experience on the job. On the job training often means working side by side with inspectors in the field. This type of training helps to ensure the individual gets the necessary experience he or she needs before making critical decisions on his or her own. Some individuals obtain additional or continuing education in aspects of construction and architectural design. This type of education helps to ensure the individual has the knowledge necessary to know how building systems operate and how to inspect aspects such as the proper angles, the durability of various materials, weight limitations, and building condition. Though education in this area is not always a requirement, it can be very helpful in securing government-related positions. The Bureau of Labor Statistics provides some information on the overall job outlook for individuals in this field and the earning capacity. According to the agency, the 2010 median pay for people working as construction and building inspectors was $52,360 per year or $25.18 per hour. It also noted that between the period of 2010 and 2020, this job field is likely to see growth at the rate of 18 percent, which is about as fast as average. This will add 18,400 jobs to the field over the 10 year period. Working as a building or construction inspector can be rewarding, especially when you know a home or building is safe for individuals to use and live in. With proper training, this can be a long-term career. Copyright © 2012-2014 WebCollegeSearch. All Rights Reserved.